A Quantum Leap is game for two to four players using a standard 52 card pack: players aim to score points as they place cards to a display following simple numerical patterns and where thoughtfulness and skill outweigh the random selection of cards in hand. In the first stage a nine card display is set up forming the area of play for the second stage. The second stage involves players placing cards on to the display conforming to a numeric pattern such as in a consecutive sequence or by halving or doubling the value of a card on display and by doing so scoring points; see Placing Rules. 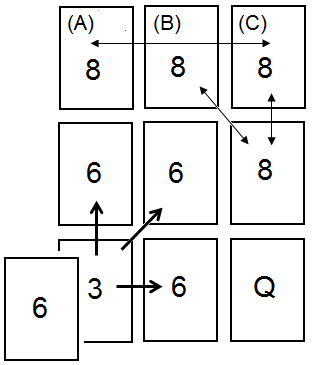 Additional bonus points can be made where adjacent pairs or sets of three cards of equal rank are formed and also where lines of consecutive sequences of three cards are created. At the start of each game one player (dealer) should separate the suits of cards, shuffle them and present a complete suit of cards as a face down stock to each player around the table. When playing in a match players should take turns to be the dealer in sequence around the table. When four play each player will be in possession of one complete suit of cards. When three play one of the suits will not be used. 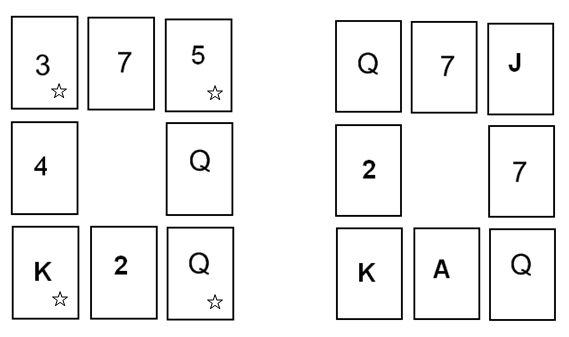 When two people play, each will use one complete suit of cards before taking up the second suit; when the last card of the first stock is placed the second stock may be taken up and used on the player’s next turn of play. For the purpose of play the values of the cards are: Ace is 1 and also 14; cards 2 to 10 are as face value; Jack is 11, Queen 12, and King 13. Please note that an Ace can follow a King in a sequence and a King may follow an Ace. The four suits have no significance in the play of game - they are used only to distribute the cards fairly to the players. Stage one: creating the table display. To begin each player should have their stock of cards face down on the table. The dealer starts forming the 3×3 display by taking a card from the top of their stock and placing it face up on to the table. 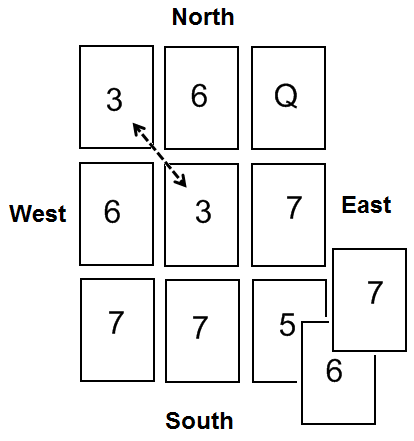 Each player in turn does likewise, placing the top card of their own stock in any of the remaining empty display positions other than the centre, and this continues until the eight outer cards have all been placed. The central and last card to be placed is called the “Higgs Bonus”. At this point the dealer picks up his remaining cards and chooses a card from those remaining in hand to place in the centre. By placing a suitable card it may be possible to score by creating a line of equal numbers or a consecutive sequence in a row, column or diagonal. 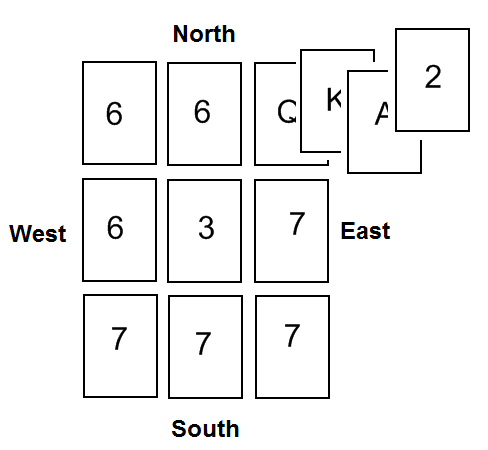 When two and four people play the dealer always places the first and last card of the display; where three play, the player to the left of the dealer places the eighth card and then the dealer places the central ‘Higgs’. 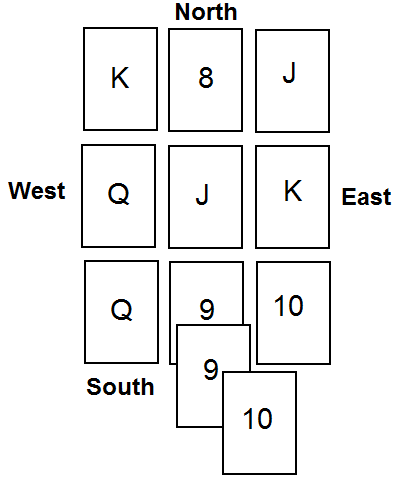 The image shows a starting display of nine cards; the dealer ‘South’ taking the top card from their stock placed the 7 of Hearts; ‘West’ did likewise placing the King of Clubs; ‘North’ the 6 of Diamonds and ‘East’ placed the 3 of Spades. Further cards were placed in turn and with the dealer ‘South’ placing the 6 of Hearts to the central space in order to obtain a bonus score - in this case 2 points for the pair of sixes. See images, scoring and bonus points for further information. This completes the first stage of the game. The player to the left of the dealer is the first to place a card to the display. During their turn each player will aim to score points by placing cards of their choice from their hand on to the display by using the principles of the three placing rules; see Placing Rules and diagrams of game openings. Up to four cards or as few as is considered appropriate may be used per turn. Using more than four cards in a turn of play incurs a penalty: four points are awarded to each opponent. Note: when only one player remains with cards in hand this rule no longer applies. The first card played to the display at the start of stage 2 must be placed using either Placing Rule 1 or 2. This establishes a 'pattern of play', and subsequent plays by all players must continue the same pattern until it is changed by using Placing Rule 3 or using the ‘Quantum Leap and the Strange Particle Rule’. When a player is unable to place a card at the start of their turn any cards in hand are to be placed “face up” on to the playing surface to demonstrate that no play is possible; (an unused second stock in a two player game does not count as ‘in hand’). This rule is particularly relevant when children play and avoids disputes occurring. When a player can again take a turn the cards can be returned to hand. Placing Rule 1; a card is placed on top of a card that is adjacent in value. The resulting numerical sequence follows a descending pattern or ascending pattern. If the current pattern is ‘descending’ and a 9 is showing, an 8 may be placed upon the card. Further cards placed can be placed following the descending pattern for example by placing a 7 on the 8 or similar actions on other cards on the display. The same principle would apply if the sequence were ‘ascending’. See images of game openings and scoring. Placing Rule 2; a card is placed that either ‘halves’ or ‘doubles’ the value of the card on display; e.g. where a 4 card is on show a 2 or 8 may be placed on top of it. If the pattern of play at the time was halving, a 2 could be placed on a 4, or a 3 on a 6, etc. If the pattern used was the doubling, an 8 could be placed on a 4 or a queen on a 6. See images of game openings and scoring. Placing Rule 3; a card is placed on top of an equal valued card in the display; e.g. a 9 is showing and another 9 is placed on top, or say a Jack (11) has another Jack placed on top etc. See images of game openings and scoring. Putting down a card using Placing Rule 3 allows a new sequence or pattern to be started with the next card played; e.g. 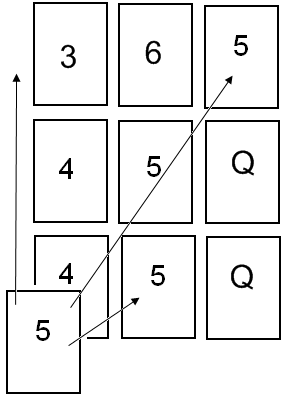 the player may then use either Placing Rule 1 to ‘ascend or descend’ or Placing Rule 2 to ‘halve or double’ or even if considered appropriate, place another card using Placing Rule 3. When Placing Rule 3 is used to end a turn the next person to place a card has a free choice which rule to use. The Quantum Leap and Strange Particle Rule. Owing to the special numerical relationship of the Ace card (as 1) and the number 2 card, (1 and 2 are sequential but also halve or double each other) the placing of one on the other automatically changes Placing Rule 1 (ascending/descending patterns) to Placing Rule 2 (halving/doubling patterns) and vice versa; this is the only time Placing Rule 3 does not have to be used to alter a pattern of play. Changing a descending pattern of play; e.g. a player is following Placing Rule 1 in a “descending” pattern and places an Ace on to a 2 card. The Ace not only follows the descending rule but also halves the value of the 2 card. Further play must follow the “halving pattern” principle of Placing Rule 2 unless a player chooses to use Placing Rule 3. Changing an ascending pattern of play; placing a 2 card on an Ace following Placing Rule 1 in an “ascending” sequence automatically doubles the value of the Ace (numerical value as one). The next turn of play must follow the new “doubling principle” of Placing Rule 2, unless Placing Rule 3 is used. Changing a “halving” pattern of play; an Ace card placed on a 2 card during a “halving pattern” changes the next play to the Placing Rule 1 “descending” pattern and the next cards placed must obey this principle unless a player chooses to use Placing Rule 3. Changing a “doubling pattern of play; a 2 card placed on an Ace placed during a “doubling pattern” changes the next play to the Placing Rule 1 “ascending” pattern with further cards placed obeying the ascending pattern of Placing Rule 1 unless Placing Rule 3 is used. No score: The placing of a card by using Placing Rule 3 scores no points and with no additional bonus scores allowed. One point: is scored by placing a card using Placing Rule 1 (and bonus scores can be added). Two points: are scored by placing a card using Placing Rule 2 (and bonus scores can be added). Note: several bonus scores may be made by the placing of one single card; see images. Two points: are scored when a card placed creates an adjacent ‘pair’ of equal ranked cards along a column, row or diagonal; e.g. a pair of Kings. Three points: are scored when a card placed creates a consecutive sequence of three cards in a line along a column row or diagonal; e.g. an ascending or descending run of 8, 9, 10. A line of 8, 10, 9 would not score since the cards are not in order. Six points: are scored if a card placed creates a set of three equal ranked cards in a line along a row, column or diagonal; e.g. Queen (12), Queen and Queen. A game ends when all players have used all their cards or no more cards can be played. Points are totalled. After all players have had an opportunity to deal, the player or team with the highest score wins the match. In this game opening the dealer ‘South’ placed a 3 (for the Higgs Bonus) to the centre scoring two points for a pair of 3’s (the two equal ranked cards indicated with dotted arrows). ‘West’ starts the second stage phase and chooses Placing Rule 1 in an ascending sequence, placing a 6 on the 5 for one point, then continues by placing a 7 scoring another point and decides to complete their turn of play. ‘West’ also scores bonus points as placing the 7 creates a double 7 and a line of three 7’s. West’s scores 2 points for placing two cards using Placing Rule 1; two points for the double 7 and six points for the triple 7, totalling ten points. See next image and scoring rules. Notice the dotted arrows indicating the double and triple bonus score from West’s previous play. ‘North’ takes their turn deciding to continue with Placing Rule 1 so places a card that numerically ascends. A 4 card is placed on the top left corner 3 followed by the 5 completing a three card running sequence on the column. 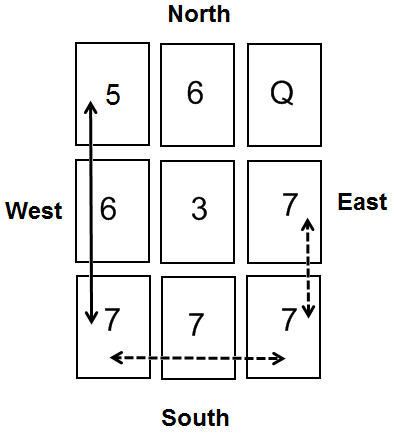 ‘North’ scores two points for placing two cards using Placing Rule 1 and scores a bonus of three points for the sequence of 5, 6, 7 (arrowed), totalling five points. ‘North’ completes their turn by placing a 6 on the top corner 5 (for one point) but this action creates two bonus scores with two points for the double 6 on the left hand column and two points for the double 6 on the top row. See next image with the adjacent pairs of sixes. ‘East’ decides to continue with Placing Rule 1 in their turn and places a King (13) on the Queen (12), the Ace (as 14) on to the King and finally the two, on to the Ace (as 1) scoring three points in total. Note 1: the Ace (strange particle) can have two numerical values simultaneously. Note 2: placing the two on to the Ace invokes the Quantum Leap Principle. ‘East’ decides to finish their turn and the next to play must either use the ‘doubling’ principle of Placing Rule 2 or put down a card using Placing Rule 3. In this game opening the dealer ‘South’ places the Jack as the Higgs Bonus scoring two points for the pair of Jack’s arrowed. ‘West’ starts the game with Placing Rule 2 using the doubling principle with the 6 card on the 3 (two points); then a Queen (12) on the 6 (two points) plus the bonus score for the pair of Queens in the left hand column and finally an 8 on the 4 card (two points); scoring eight points in total. This leaves ‘North’ in a difficult situation as no further cards are available to use with Placing Rule 2 forcing ‘North’ to use Placing Rule 3 to begin their turn of play. ‘North’ has little choice but to use placing Rule 3 as there are no cards available to use the doubling principle of Placing Rule 2. Several options may be open to ‘North’ depending on what cards remain in hand but the obvious choice will be to place a card that will create opportunities for a high score. ‘North’ chooses to use the 9 then opts for Placing Rule 1 (ascending) so that a 10 can be placed on the 9 (one point) but also scores a bonus of two points for the pair of 10’s in the bottom row. Tactics: There are often many possibilities for scoring additional bonus points. The next display shows a line of three of 8’s along the top row and a pair of 8’s in the right hand column and also on the diagonal. Where a card can be placed can have a profound effect on scoring; in this instance if the card placed were at (A) only six bonus points would be scored for the triple 8 sequence on the top row. However, if the card were placed at (B) or (C) an additional bonus double is scored as well as the score for the triple. The score for placing the card at (A) = six points. Score for placing the card at (B) or (C) = six for the triple sequence plus an additional bonus for creating a double with the 8 in the right hand column in the middle row. At the bottom left we see a 6 card being played using Placing Rule 2 in a doubling pattern. The action not only scores 2 points for placing the card but also a further 6 points for creating three pairs of equal rank. Below we have a multiple score from placing just one card. A number 5 card is placed on the 4 at base of the column on the left using Placing Rule 1; this action completes a diagonal line of a triple 5 and a consecutive sequence of 5, 4, 3 in the left hand column and a pair of 5’s on the bottom row; scoring one point for placing the initial 5 card at bottom left, three points for creating the consecutive sequence in the left hand column and six points for the diagonal triplet of 5’s; a pair of 5’s is also created with an additional 2 points. Twelve points in total. Note, neither the pair of Queens nor the pair of 5’s in the central column scores as they were formed in a previous play. The left hand diagram below shows a two player game where the Higgs Bonus card is yet to be placed. Cards marked with a star were placed by the dealer. The dealer has to decide which card from their hand is best placed; the main dealer has a 4, 7 or 2 to choose from if they wish to score a bonus. Which of these cards is likely to be the most useful in the forthcoming game? And which is better placed as the Higgs Bonus? 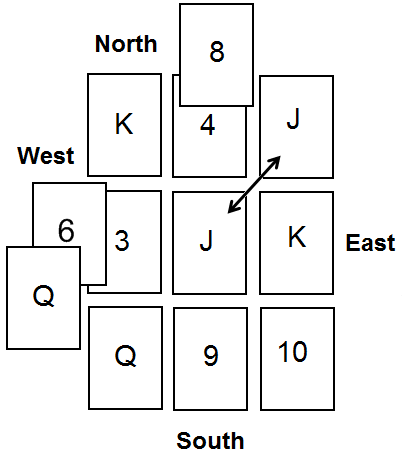 Right hand diagram: if this were a three or four player game two high scoring options are possible; if a Queen is in hand it would score six points for the three Queens across the diagonal plus three points for the run of King, Queen and Jack; nine points in total. Alternatively a 7 in hand would create two pairs for four points. Using two packs of cards will provide a game of longer duration when three or four people play. It is suggested that the procedure for taking up the second pack of cards should follow the principle used for the two player game. It is also suggested that partners should sit next to each other as this will allow one player to set up a tactic which may require more than four cards to complete. All cards are able to pick up 1 point when used in “descending or ascending” patterns of play using Placing Rule 1. It is often best to use Placing Rule 3 when scoring options are reduced. 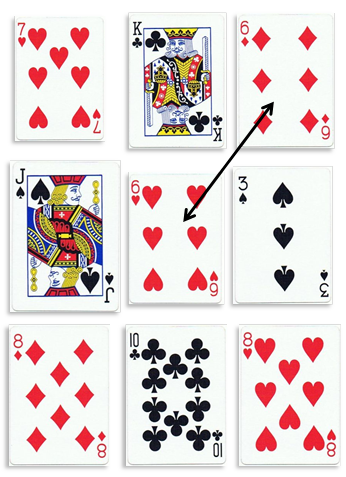 The 9 and 11 (Jack) and 13 (King) cards may be seen as weaker cards than others as they are the only ones that cannot be “halved and/or doubled”. This can be used as a positive strength when they are sacrificed for changing a pattern of play. Using the Ace and 2 cards is an effective way of automatically changing the pattern of play without losing points to opponents, but caution is needed as the reverse is also possible if played ineffectively. The Ace and 2 cards are in general worth keeping in hand and not used for any Higgs Bonus points with the exception of three and four player games where larger bonuses may be picked up on occasion.